The facilities of CARER are being extended to researchers from other institutions and for users from industries for collaborative studies and analyses of the samples. 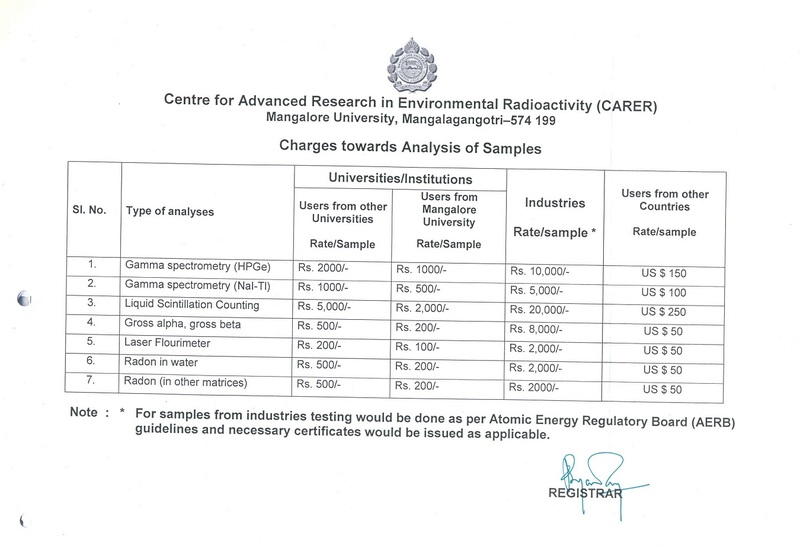 Researchers from other institutions can approach CARER for collaborative studies as well as for analyses of the samples on payment of charges prescribed by Mangalore University. CARER is accredited by AERB for the measurement of radioactivity in commodities and issuing certificates as per the regulations of BIS, Govt. of India. Industries can contact CARER for testing of materials such as, spices, packaged water, pharmaceuticals, food materials, thermal power plants, mining industries, metal industries, etc. meant for export as well as for public consumption. Select Training Program	Comprehensive training on environmental radioactivity measurements for researchers Gross Alpha and Gross Beta for water testing laboratories. Quantitative estimation of radionuclide activity for testing Laboratory.